What's this all about? It's derived from the game of "Punch Buggy." Punch Buggy supposedly started in the 1960s and according to Wikipedia is "a car game generally played by young children in which participants lightly punch each other in the shoulder upon first sight of a Volkswagen Beetle while calling out 'Slug bug!' or 'Punch buggy!' in reference to the Beetle's nickname, the Bug." Sluggy is fabricated as the person who started the game of slugging a person every time a VW passes by. It goes something like this: If a VW car, of any model or year, drives by you get to punch a person. Hopefully, the person being punched understands what you are doing and no one loses a tooth. The videos are definitely entertaining. The concept reminds me of a popular cultural icon on Twitter called @ShitMyDadSays that features quotes from a curse ridden old man who makes outlandish comments about life. The game comes with some rules developed by Sluggy with a companion blog and Twitter account (@SluggyPatterson) to assist people who want to learn the game. Rules include where to hit a person, three hits when seeing a VW with Hawaii license plates and many other tips for extending interest in the game. Making the game real with evolving rules and the ability to ask questions that may spawn more rules is an excellent way to extend the online experience. First of all, it brings life to the game for people who want to play. So watch out if someone slugs you as a VW Jetta drives by. The use of social media to ask questions, clarify rules and interact with the personality of the concept is interesting and better than most of the social media campaign outreach we usually see in the automotive industry. Here VW can have conversations with fans of the campaign instead of just simply pimping the website or YouTube video links. There is a natural conversation that exists with this idea and it lends itself well to platforms like Twitter and Posterous. One area that could use some work is in the online media marketing of the campaign. I found the campaign from a banner ad on Yahoo! mail. The ad had the confusing message of "PunchDubDays" with a circle and a fist next to the text and copy saying "We're taking a hit for you." The campaign’s message is a bit difficult to comprehend. Perhaps it's designed to be obtuse as a way to get people to learn more about PunchDubDays, but this seems weak compared to doing something a bit more playful in the ad placement. Creating some visual interest instead of the logo and campaign headline might be more compelling to draw people into the fun of the concept. 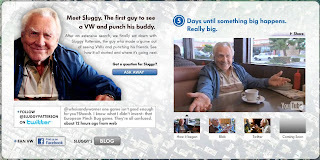 Other than the minor messaging issue, the campaign is well executed in the social space, it taps a cultural trend of listening to old men with no filter, and the writing in the videos is stronger than VW’s sister brand Audi’s Green Police campaign. It will be interesting to see where they go with this. I think brands need to establish a reason to be on Social Sites, and to get follows. Therefore creating an interesting character to follow might work. With that said, after watching the commercial I'm not more interested in buying a VW that I was when I got up this morning.